KWC pull-out-spray kitchen faucets include popular contemporary design lines Domo, Systema, Suprimo, Eve and Edge. After manufacturing the world’s first pull-out spray in 1957, KWC achieved success with high-tech designs that influence the world's best faucet companies. 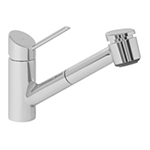 KWC single-handle faucets are made from solid stainless steel, have various features that include a lockable spray option, offer simple and sleek designs and are very user-friendly. All of our chrome KWC kitchen faucets are eye-catching in both finish and design. KWC style lines of pull-out-spray kitchen faucets will fit all of your renovation and remodeling needs. For KWC systems that need KWC replacement sink faucet heads, we carry specific lines that you can replace them with, or try interchanging them with similar lines for a customized look. KWC Zoe Pull Out Spray Kitchen Faucets are known world-wide as some of the best kitchen sink fixtures available. 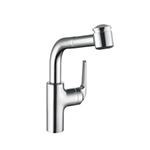 KWC Ono kitchen faucets feature a slim handle that's sleek and designed for the modern kitchen. KWC Eve Kitchen Faucets, slim and stylish with optional integrated LED Lighted Spout. Since its launch in 1982, the KWC Domo kitchen faucet is a true classic and over time has become nothing less than a synonym for the pull-out kitchen faucet. 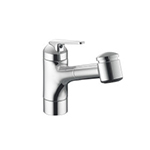 KWC Suprimo Pull Out Spray Faucets are made of solid stainless steel. KWC Luna Pull Out Spray Kitchen Faucets simple and basic, built with the quality you expect from KWC. KWC Edge series feature a lockable spray option and easy-to-use contemporary lever handle. KWC Livello Pull Out Spray Kitchen Faucets with high rise spout allow easy rinsing of large pots and pans. KWC Divo-Arco Pull Out Spray Kitchen have a loop style handle on top or side that is easy for gripping and turning. KWC AVA Pull Out Spray Kitchen Faucets are simple, modern and functional for any contemporary kitchen setting. KWC has done it again with the elegant AVA kitchen sink faucet. KWC Deco Pull Out Spray Faucets are transitional for any style kitchen. KWC Saros pull down spray kitchen faucets. KWC SIN Pull-Down Spray Kitchen Faucets are sleek, stylish and built for contemporary designed kitchens. KWC has delivered a concealed pull-down faucet with modern kitchen users in mind. KWC Systema Pull Out Spray Kitchen Faucets are known world-wide as some of the best kitchen sink fixtures available. - Please note, limited stock is available!